Being in the shallow water is great for beginners, those recovering from a recent illness or injury and even pregnant women. Finding a pool with ankle/knee deep water may be a challenge though. Sometimes, this may require using a children's pool or even a pool at home. Begin by walking in this shallow water, as you begin to feel more comfortable with the resistance on your legs, move to a chest-level height. 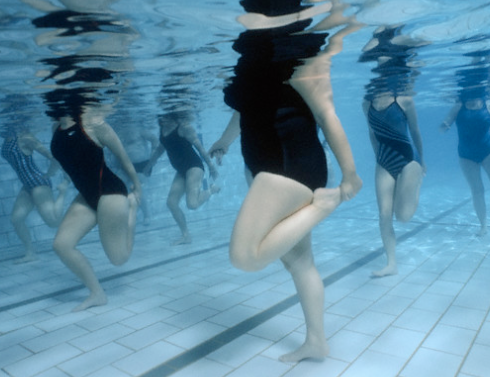 This higher level of water will provide not only great resistance for all submerged muscles, it will burn calories at twice the rate of walking on land. Try to keep at a rigorous pace to continue keeping the heart rate elevated. Deep water running is usually acceptable in the set aside lanes at most pools. If your pool doesn't provide a buoyancy jacket or vest, a pool supply store should have some in a few sizes. The vest prevents you from touching the bottom of the pool and keeps you afloat. Running through the lanes this way is an intense workout that will melt calories and tone arms, legs and core. Again, the local health club, recreational center or gym will have a water aerobics schedule. Find an appropriate time that works for you. Remember, if joining an ongoing class, don't be intimidated by the moves or the fact that others seem to know the routine; you'll learn. Be sure that once you learn the moves, you practice them in water that is suitable to your height; not everyone will get a great workout in the same depth of water. -Do knee bends, raising one knee at a time up to waist level. -Stationary jog, jump, or do jumping jacks. -Try large and small arm and leg circles. -Try to attend all the scheduled classes for the greatest benefit. Kickboarding is an exercise that children and adults can use to learn better stroke and kicking skills, but it's also good for water fitness as well. Holding a kickboard affords you the time to focus on breathing, as well as control of movement. Be sure to hold the kickboard with arms extended straight out in front for the best benefit. Kick legs hard and fast while keeping the knees together. Control of your core and upper legs will give you greater resistance and an even better workout. Always start with a warm-up lap. Pick a set number of laps to swim and then get out and stretch your muscles. Then, hit the pool for another set. Swimming pool laps are therapeutic, the rhythm eliminates stress and give the whole body a full workout while keeping the core temperature level.